I wanted to meet two sisters in the food and wine business. Their elderflower juice was so aromatic. A reader wants to know: What kind of wines would you put together for an office party, assuming a budget of Rs.2,000 per bottle? I put this question to Juliette Monmousseau, deputy managing director of the United Spirits owned Bouvet Ladubay. I am with Monmousseau, her chef-sister Marie, and Abhay Kewadkar, head of the wine business of United Spirits Ltd. It is 4pm at the ITC Gardenia, Bangalore. 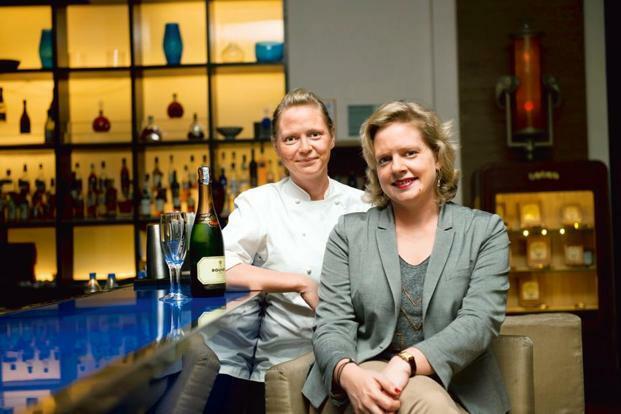 Later that evening, the Monmousseau sisters will showcase their sparkling wines at a special dinner. Chef Marie has smuggled a black truffle the size of a sweet lime to shave on top of one of her salads. It smells of earth and pig. We discuss the number of Indian brands that are coming out with sparkling wines. Sula launched three new sparkling wines two months ago. Kewadkar is an old Bangalore hand. He began as a winemaker with Grover wines (Grover Zampa Vineyards) and has now morphed into a steely-eyed winemaker-businessman with his eye on the bottom line. He speaks about European wines in an earthy Maharashtrian accent and as a result, doesn’t come across as pretentious. I like Kewadkar, even though I don’t care much for the Four Seasons brand that he manages. If you asked why, I would be hard-pressed to come up with a reason. The wines are decent, but somehow I don’t like the packaging design, and the fact that the name has no connection with India. Newer brands like Mandala, Big Banyan and Deva are more confident in their branding approach. Their names allude to India. Four Seasons dumbs down its wines, if that makes sense. Bouvet Ladubay’s sparkling wine is good. Chef Marie brings out her walnut oil and a fragrant elderflower juice that she will use to prepare her dinner. The two sisters and their father, Patrice, manage the brand, even though Vijay Mallya owns it: something that isn’t widely advertised in the European press. “…though no longer owned by the family, is still operated and managed by the fourth generation of Monmousseau family,” is how a typical press report is phrased. The French don’t like us Indians and Chinese buying up their brands. I can relate. The Goans don’t like the Russians taking over coastal Goa. Later that evening, I attend a scintillating discussion with Arvind Panagariya on his book, Why Growth Matters (co-authored with Jagdish Bhagwati), which recently made the Financial Times Books of the Year 2013 list. It is a heated, heartfelt discussion by a group of optimists who care about India. There are the lefties like me who don’t completely buy into the “economic reform above all” approach; who question whether it is inclusive enough. There are others—bankers, CEOs and entrepreneurs—who believe that the growth model is the best solution for poverty alleviation. Over bottles of excellent wine, we argue into the night. The discussion—as always—turns to China and how it has lifted millions out of poverty through its growth-oriented approach. Yes, but China has lost a lot in the process, I argue. It has divested the scholarliness that once permeated its culture—one that is beautifully described in Bette Bao Lord’s book, Spring Moon. China’s hurtling growth has swallowed the gentler arts like calligraphy, degraded its environment, and most importantly, squandered its culture. China was once the mother lode of all the arts that travelled to Korea and then ended in Japan. Ceramics, calligraphy, watercolour paintings, and pretty much every refined art form that we laud in Japan originated in China. But these are not the things the world associates with the country any more. How to put a price on what has been lost? How to balance growth with culture and indigenous arts? There are a few cultures that have achieved this. The Japanese model has been sequential. When Japan was a basket case, nobody knew about its culture. Once the economy started ascending, everyone wanted a piece of the culture. I recall Harvard Business School students studying Japanese in the 1980s and 1990s as a way to access the culture. Once Japan’s economy triumphed, the world paid attention to its arts. China is at the stage where the world knows its economy but little about its arts. Indeed, the long lines of Chinese who worship at the altar of Louis Vuitton seem to care little about their own culture. If it follows Japan’s sequential model, a focus on culture will follow the growth of the economy. Other countries—those in Scandinavia in particular—take the concomitant approach where they preserve their culture while growing their economy. France—more than any other country—has managed to preserve its culture and arts and keep them relevant with its changing economy. It has—to put it crudely—managed to monetize its culture and therefore preserve it in a changing economy. Wouldn’t that be a good model for India to follow? Economists will question France’s taxation policies and lack of reforms, but France is still the mecca for anyone interested in fashion, perfume, arts, jewellery, watches and wine. Perhaps Bouvet Ladubay should present its wines to Indian economists such as Panagariya to to prod them to ponder on whether economic growth and culture-preservation can happen concomitantly. Then again, Panagariya is a teetotaler. Shoba Narayan is listening to J’ai Deux Amours by Dee Dee Bridgewater to accompany her sparkling wine.